Things can get a little tricky when shopping for an affordable granite kitchen sink. This is because you often have to compromise on one of the important factors, as many granite sinks in this price range are not a “complete” product. The Blanco Precis, however, manages to buck the trend. It’s especially a great choice for a modern kitchen or when you are redoing your kitchen. The Blanco Precis somehow manages to be both simple and elegant at the same time. This is really a good thing because some of the single bowl granite sinks try to offer so much in terms of the design and style that it becomes a bit of an overkill. Not the Blanco Precis though. There isn’t anything crazy about its look, and yet it looks very elegant, and will surely enhance the overall look of any modern kitchen. This is something that really surprised us. The picture you see on the product page for this product makes it seem as if the sink is on the smaller side and it may be difficult to wash large pans and pots in it. But it’s actually the exact opposite of that. 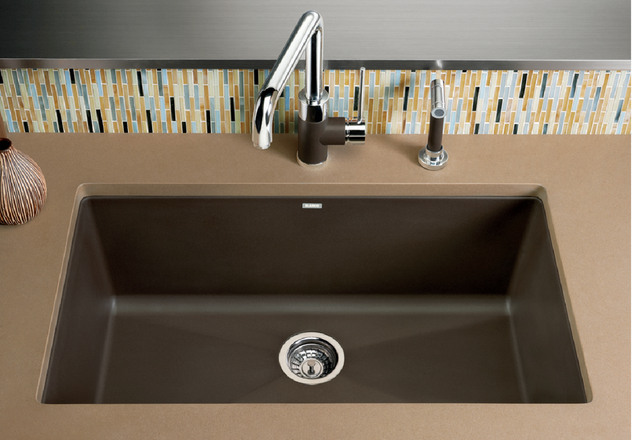 While the sink is perfectly sized to fit any kitchen easily, it’s very deep and large. Washing large utensils in this sink would be a breeze, and you would also be able to keep them in the sink for soaking. Solid granite is believed to be very durable, and many of Blanco’s granite sinks in this price range are made of 80% granite, including the Blanco Precis. And this is something you would be really pleased with, as the durability is usually a concern when going with a granite sink in this price range from other brands. However, with solid granite being the main material used to make the Blanco Precis, it means that it will serve you well for years to come. It might get some stains over a period of time, especially if you let leftover food stuff sit in the sink for too long, but other than that, there’s really not much to worry about. This is another feature hard to come by when buying a granite sink on a budget. The surface of cheap granite sinks often has a sticky feel to it, as the granite material used to make them isn’t very high quality. This leads to the food stuff getting stuck to the sink’s surface, and if the sink has a flat surface, it can give you a hard time when trying to get rid of it. The Blanco Precis, however, has a surface that doesn’t absorb food stuff or color, and the leftover food stuff doesn’t get stuck to it in a way that makes it difficult to remove it. In fact, if you seal it using a solution specifically made for granite, it wouldn’t let anything stick to it at all. This would make it even easier for you to clean it, as the sink itself will become almost self-cleaning. With all that said, however, it’s important to note that at the end of the day, it’s still a granite sink so if you let the food stuff stay in the sink for way too long, it will eventually stain the sink over time. But if you avoid doing that, you should have no problem maintaining the great look and finish of the sink. 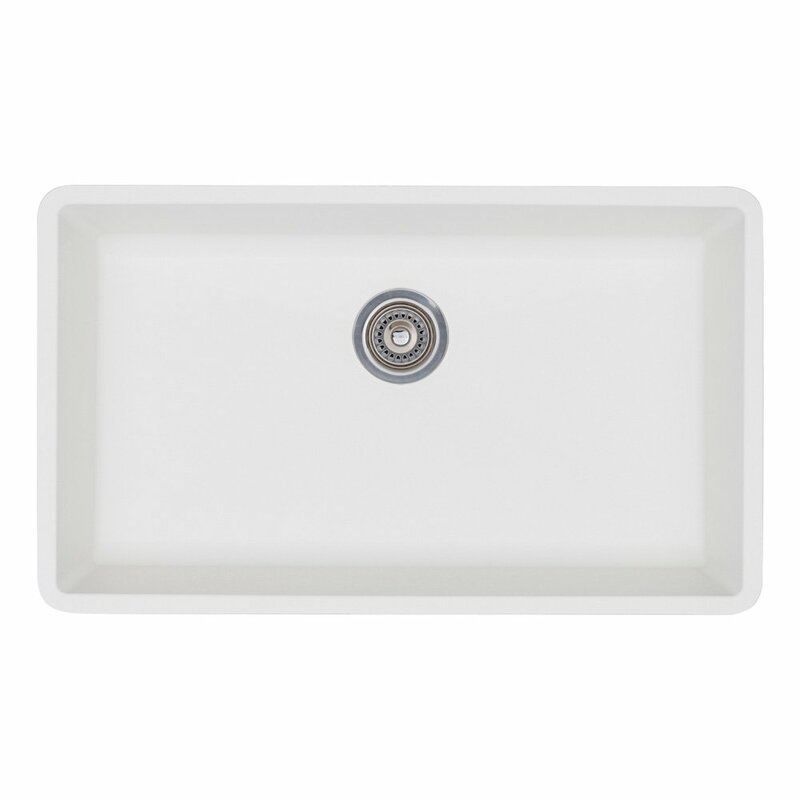 If you’re willing to be just a bit careful with the way you use the Blanco Precis, it may turn out to be a solid granite sink option on a budget.